a low heat for 10–12 minutes until soft but not browned. soup bowls with a spoonful of the pesto stirred through. 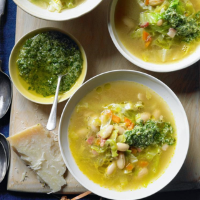 You can use any kind of cabbage or kale for this soup. Serve Waitrose Cotes du Rhone-Villages, Gabriel Meffre 2009, France, £6.99/75cl. Rhone 2009 was a near perfect vintage and the savoury but ripe, brambly flavours of this classic blend of Grenache, Syrah and Mourvedre echo the pancetta's rich smoky flavour and cannellini beans' smooth, velvety texture.